Wednesday evening August 19th, I put the new Baraldi range vent to the ultimate test. I made a meal that requires 3 burners. I put two pots of water on to boil and just before they came to a boil I turned the burner on under my frying pan to sauté some onions. And the vent turned itself off. AGAIN. Boo Hiss. This is what the original one did on a regular basis. Clearly the problem is not unique to just one range vent since we’ve now had 2 do it and when we got a new motor for the first one, it did it too. We believe at this point, that there is a design flaw and that the vent isn’t capable of dealing with the heat that the three burners put out. Bummer. I’ve written a letter of complaint to the President and CEO of Airstream about our situation and what we’ve gone through with 5 range vents and one new motor. However, when I went to print it out, our printer needed more ink (at least I hope that’s what the problem is). When we went to town to get a new ink cartridge, the Forest Service had just bought all they had in stock (no doubt they have the same mobile printer we do and are using them out at the fire headquarters). When something like this happens I begin to wonder if maybe I shouldn’t be mailing the thing... And then that evening, I made another 3-burner meal and the Baraldi DIDN’T shut off! So now we have the problem that it works part of the time—an intermittent—nobody’s favorite. We’ll just have to watch it and see. Meanwhile, since I still don’t have any ink, I’m holding off mailing my letter of complaint. 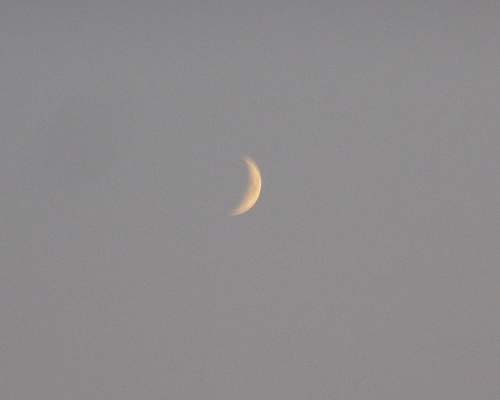 Later that evening I spied the crescent moon hanging in the twilight sky. And the smoke made for another eerie sunset. 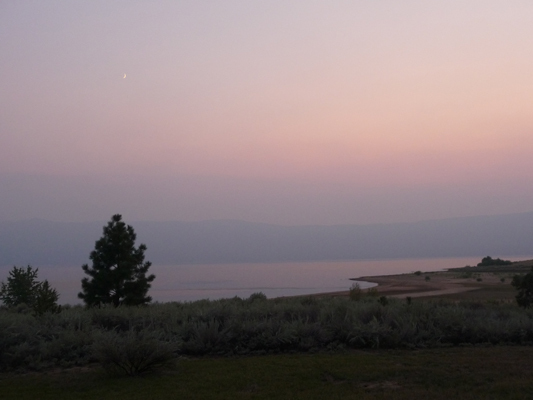 By Thursday August 20th, the smoke was so bad that we couldn’t see the far shore of the lake again. But the forecast was for the wind to shift and begin to blow from the southwest and we had a chance that it might clear up. We puttered around the campground getting ready for what looked like (and turned out to be) a really quiet weekend. 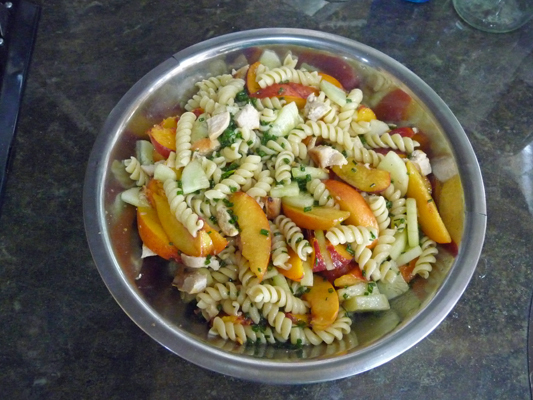 The All Staff Park Pot Luck was that evening and I made my old stand-by Nectarine Pasta Salad. It was it’s usual hit though a few of the folks (the hosts this half seemed to be a rather older lot than the first half over on the west side) complained about the cucumbers! I guess they felt about them the way my mother did. She always called them “cu-come-burpers”. The wind came up from the north in the evening and on Friday morning we could once again see the mountains across the lake! Whoo Hoo! 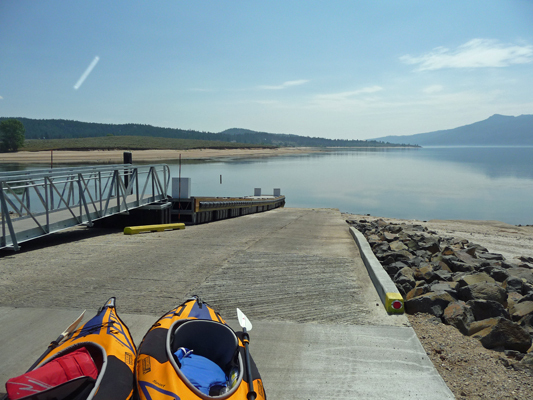 We’d hoped to get out on the water again in the kayaks but it was breezy most of the day. But it sure was nice not to have the smoke around. The lake was now so far down that our boat ramp wasn’t much use to bigger boats. There was only a foot or so of water over the last few feet of the ramp and the last big pontoon boat that came out on Thursday evening had a real heck of a time getting back on it’s boat trailer. We’ve had a lot of folks come look at the ramp and shake their heads and turn around and leave. 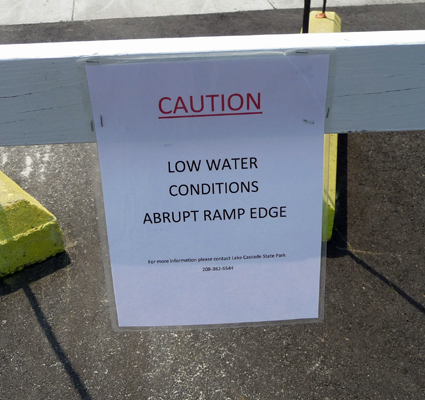 The ranger put up a caution sign about the low water. But a group of bass fisherman having yet another tournament, still launched early on Saturday morning leaving only a couple of empty spots in our boat ramp parking lot. They mostly don’t have BIG boats but some of them are pretty costly and I can’t imagine the damage that you could do to a fancy chrome propeller dragging over the rocks out past the end of the ramp. They’re known to be a crazy lot so I guess this is just another example of the insanity. The campground was indeed only 1/3 full for the weekend. We had a number of walk-ins which at least added a little fun on Friday evening but on the whole it was quiet. We’ve discovered it’s really nice only having 16 or 17 campers in the place. And of course it’s good training for our next assignment where we’ll only have 18 spaces total in the campground. I think I could get use to this. Some time in the night, the wind shifted and we were once again socked in with smoke on Saturday morning. Someone I talked to down at the boat ramp said it reminded him of being at the coast—it looked so foggy out there. You couldn’t see the far shore and there was just the barest outline of the mountains to the west. When you look southward it’s just grey so you can pretend it’s the Pacific if you want. When it was clear on Friday we could see huge billowing clouds of smoke rising from the New Meadows Fire just north of McCall. There are two more fires in the area though one is to the east so it’s smoke is not heading our way at all. Our reservation list for our last weekend here arrived on Saturday morning too. And we only had 7 reservations for the coming Friday evening—half what we had this weekend. Several people had asked about Labor Day weekend so we went on-line and checked. There were 6 camp spots available in all of Lake Cascade State Park and they were all here at Sugarloaf. I would suspect that all 6 will be gone by the time that weekend arrives and Sugarloaf will be full again. But we will be in Oregon by then and so we’ll miss it. 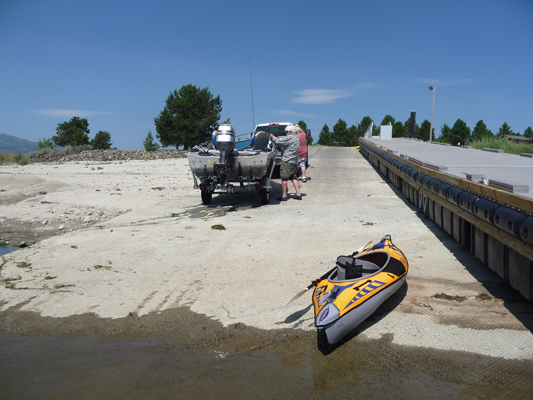 On Sunday, I got to watch a couple hassle with trying to get their boat back on it’s trailer properly at the boat ramp. First they got it on the trailer and pulled the trailer out of the water and noticed it wasn’t sitting properly. So they backed it back down the ramp and into the water. To get it floating again they had their truck in so far it was blowing bubbles from it’s tail pipe. The wife waded out to waist deep and then back up a ways to help wrestle it back into position. They got it out but it was a lot of work and they did admit that late season boating was not any where near as much fun as when the lake was full! 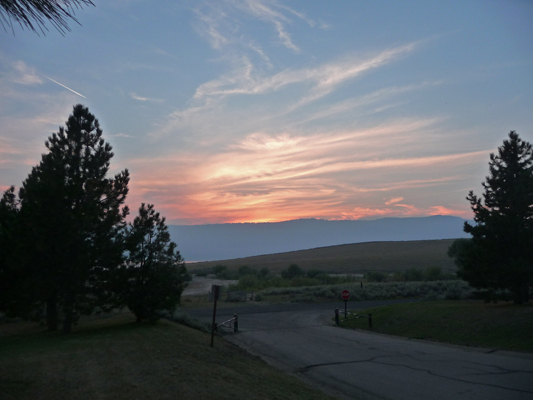 Sunday night we had an interesting streaked sunset. Monday August 24th, we went to McCall to do laundry and shopping. The Laundromat was once again full—this time with people who work for the food service company that is feeding the firefighters at New Meadows. They were so excited to see a washing machine after washing things in the hand washing station for a while. One guy said he was so excited when they gave him a cot to sleep on he could hardly believe it. Nothing like camping out to make you appreciate the smaller things in lie. The projected containment date for the New Meadows fire is Oct. 15th—no doubt when the rains and snow come to help put the fire out. 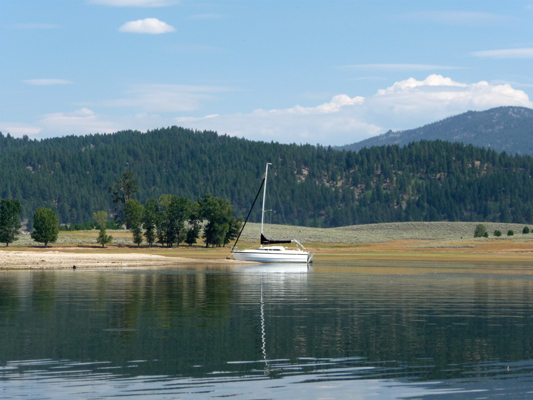 The smoke wasn’t bad in McCall and we went over to Ponderosa State Park for lunch. There was one person on the beach where it had been shoulder to shoulder just a few weeks ago. The grocery store was pretty empty too (nice for a change). Clearly the summer crush is pretty much over except for Labor Day Weekend. The smoke cleared out even more on Tuesday August 25th so we decided to leave our entirely empty campground and go on an adventure. We’d had no one in the park on Sunday night but Monday evening we had a pair of fishermen who were camping in the site as far from our spot as you can get. They’d caught a couple of large trout, a good-sized small-mouth bass and a nice sized perch plus another trout still in the boat. They showed us their catch because otherwise it’s ‘just a fish story’. They left Tuesday morning after fishing for a while longer in the early hours. We drove southwest out Cabarton Road to the road up Snowbank Mountain. This was the road we drove on our first outing back when we arrived in June . 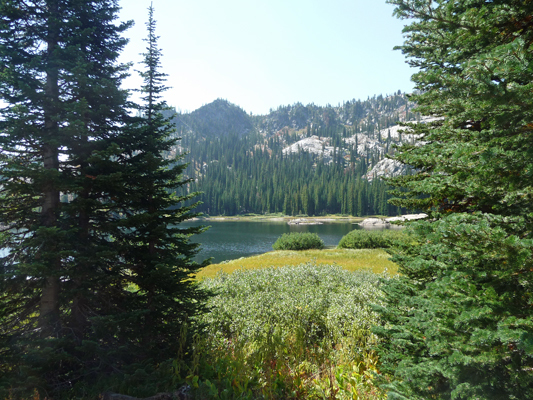 This time we were intent on taking the 2-mile out and back hike to Blue Lake. As we were getting ready to set out a 3 to 4 year-old girl came walking up the trail with her dad. She’d done the whole hike on her own and was pretty proud of herself (so was Dad). We figured if she could do it, so could we. This is a pretty popular hike. There were three cars and a van (from Meridian Parks and Rec, down by Boise) in the parking lot when we set out. There were even more than that back in June—both times mid-week. It was still in the high 60’s and very pleasant when we set out. There had been tons of flowers here in June but it’s been a long hot summer so most everything was pretty crunchy. 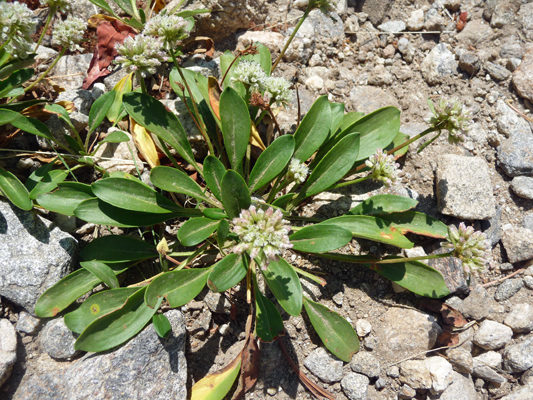 There was some buckwheat in bloom in amongst the scree. The trail goes steeply down hill for a good 1/2 to 2/3 of a mile. 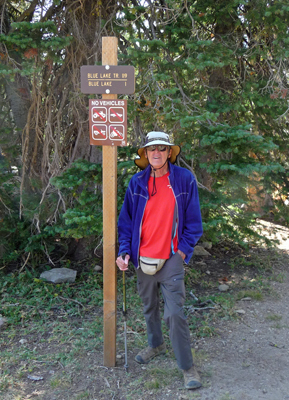 I was glad to have my hiking pole with me since it was rocky and the dirt was loose and dry. 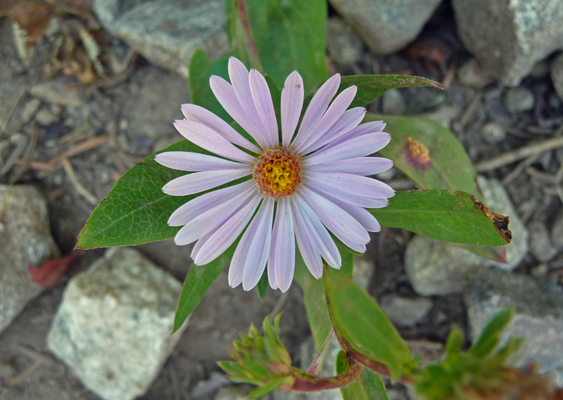 Here and there I spied a few of what I think were Alpine Asters (Oreostemma alpigenuum) that were still at peak. Most of them had wilted into purple smudges. We met a group of adults as they struggled back UP the trail and later discovered they were the people who belonged to the Parks and Rec van. Clearly they had left Meridian early since it’s more than a 2 hour drive and they were on their way back up at noon. 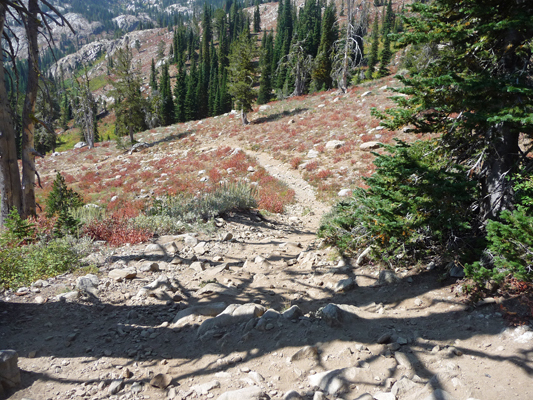 The trail levels out for a while before it climbs a little and then dips down to Blue Lake. We could hear children’s voices across the lake so we stayed on this end to enjoy the views. The lake is down a bit from its high water line but it wasn’t bad. There were hoof prints in the mud along the edge so clearly people ride their horses out here. We sat and watched the fish jump—with flashes of silver so they were pretty big fish. There was a gentle breeze and the sky was remarkably blue considering the number of fires there are in every direction here in the west. Fully rested, we headed back UP the trail. We crossed a grassy meadow with a nice view of a nearby escarpment. We stopped a few times to rest on the way up. Mother Nature was nice enough to provide us with both shade and rocks and downed trees to sit on. We were pleased that neither of us felt any worse for wear from this hike. Clearly the hiking and biking we’ve been doing is keeping us fit. 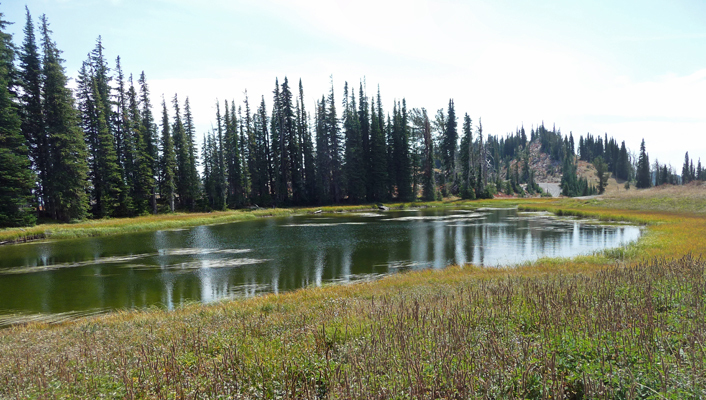 We drove across the road over past Potter’s Pond again for lunch. We were surprised that it still had quite a bit of water in it so late in the season. 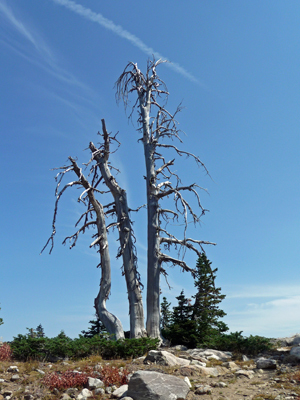 The snags up the hill from the picnic area were standing sentinel. 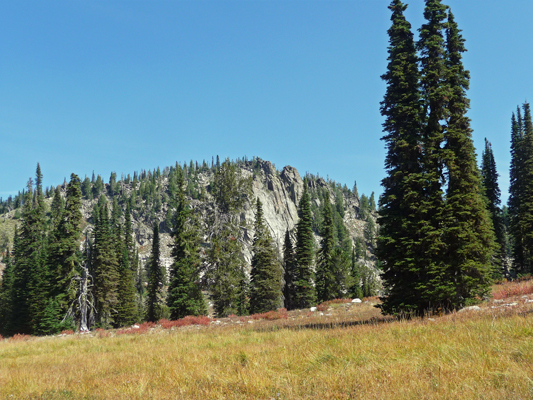 After lunch I hiked up the rise and took a panorama shot of the lower section of Long Valley. There was some smoke but it really was pretty darned clear. We drove on back home and the smoke got thicker as we headed north. While the mountains were still visible it wasn’t any where near as clear as it had been in the morning. We were both grateful that it had been clearer in the morning or we might not have set out for what had been a lovely clear day up in the mountains. We were empty again on Tuesday night. It’s pretty strange to be the only ones in this big campground. 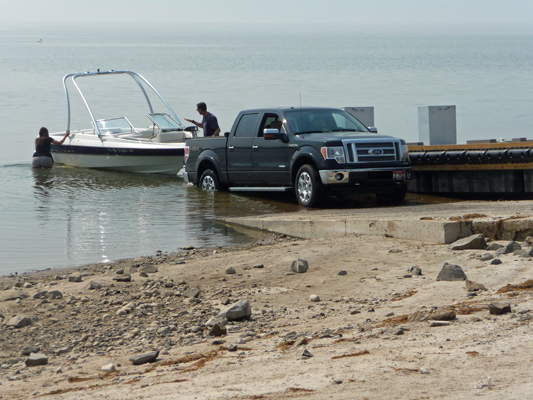 We watched a few folks drive out to the boat ramp with their boats but they all turned around and drove back out. The water is just too far down. I awoke at about 8 am on Wednesday morning to silence. Oh oh. The sprinklers were set to come on and they usually wake me up at 7:20. I peaked out the window and there wasn’t any water running anywhere. Walter, the dear man that he is, got up and got dressed and went to investigate. The controllers were running and said that zones 3 or 4 should be getting water. And there was no water to be seen. He hopped into the truck and drove down to the boat ramp to check the pump. While the phase converter for the pump was running the pump wasn’t. We can only hope that the intake got plugged with weeds or mud and the pump shut itself off. We asked a ranger later in the day if the pump had a failsafe and he assured us that it did. We called in about it and were told it was fine to turn the system off. They were going to come and pull the intake and the pipe out that day anyway. On Tuesday they had turned the irrigation off because the seasonals were spraying weeds in the grass. And now we were shut down for good. Since the irrigation only ran on Monday, I set the sprinkler up to run on the sod since we’re in the ‘every other day’ portion of the process of weaning it from regular watering. We’ll water it again on Friday and Sunday and then it will be on its own when we leave on Monday. We puttered around while the irrigation ran. Walter dug out the excess ashes in one of the fire pits since it had gotten pretty full. It’s only the third one he’s had to do all summer. We decided that since it was warm and the lake seemed to be pretty still we’d take the boats out one more time. We pumped them up and loaded them into the back of the pickup and drove on down to the boat launch—where we found a crowd of people gathered around our park manager. 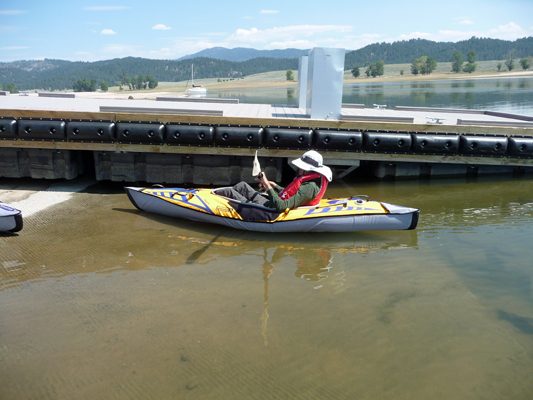 It turns out that the State Parks senior management team and Board were on a visit and Theresa had brought them out (on a small bus) to see our new boat ramp. Half the crowd was more interested in us unloading our boats than they were in listening to her spiel. We apologized for crashing her party and she said not to worry. What she really wanted to tell me was how much she had enjoyed my blog post about the Water Hooligans Race! I’d sent it to one of the rangers so he could see it and they all share the same email account. She said she hoped I didn’t mind but that she had shared it with a number of folks on the tour. Pleased, I said no problem since it would soon be posted on our website anyway. Nothing like a little praise to make the author very very happy. We set out going west past our little cove (which has mostly disappeared). It was pretty glassy and lots of fun to paddle in. 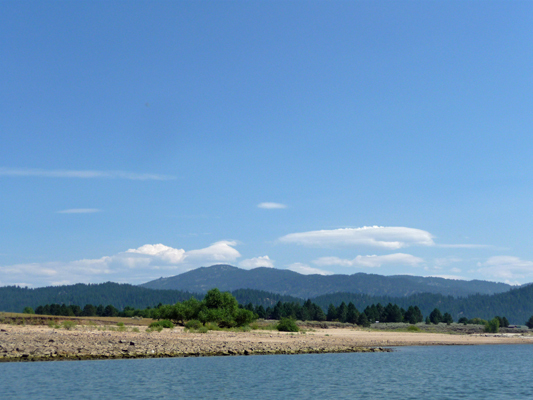 I wanted to get out past the point (on the right) to see what I could see of Sugarloaf Island. It wasn’t far and sure enough the view was worth the journey. 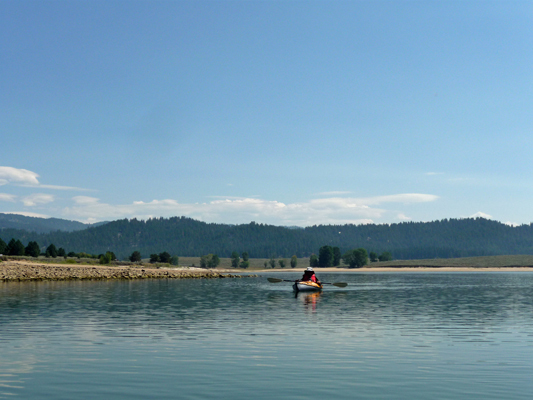 If we were very industrious and set out early enough we could paddle to the island but neither of us felt the need. I’ve found I’m much happier if I just paddle around rather than having some goal of getting somewhere. Then when the wind shifts or either of us gets tired we can just turn around and paddle back. The view southward down the lake was a little hazy but not bad. Walter called to me to slow down. He wanted to catch up with me so he could have a drink of water and I had the water bottle. I could have been mean and played catch me if you can, but I waited for him instead and we managed to make the transfer twice without dropping the bottle in the drink. By the time we turned to head back we’d had a couple of boats pass so we had their wakes to deal with and there was a bit of a chop from the wind beginning to come up. All that rocky beach was under water back in June. The lake is WAY down. As we followed the shore we could see the campground along with a decent view of Genevieve there on the far right. The stripes in the water are a combination of reflection, water weeds and waves. We came around the point and someone was using the boat ramp so I swung wide and took a photo of the sailboat moored to the sand spit. The owner stopped by over the weekend to let us know he’d most likely be taking it out of the water this coming weekend. He’ll have to use the boat ramp down at Blue Heron because there’s no way he’ll make it out here. I pulled my boat in when the guys finished pulling their boat out. It had taken quite a bit of work and they said they wouldn’t put it in here again, it was just too shallow. And this was NOT a big fishing boat. Their other comment was that the water was just too warm for the fish. It was lovey and warm when I was wading around on the boat ramp but then it was only mid-calf deep. My guess is this may be the last boat out of Sugarloaf this year. As Walter followed me in, I got a photo of him and the edge of the boat ramp. The very end of the boat ramp is lined up with the end of his boat. I was standing on the edge to take this photo and it was only up to my mid-calf. Past the edge there be large sharp rocks. We’ve got a couple of more hot days in the forecast (temps in the high 80’s maybe) and then it’s supposed to steadily cool off. The lows have been down into the low 50’s some nights and it may even get down into the 40’s over the weekend. 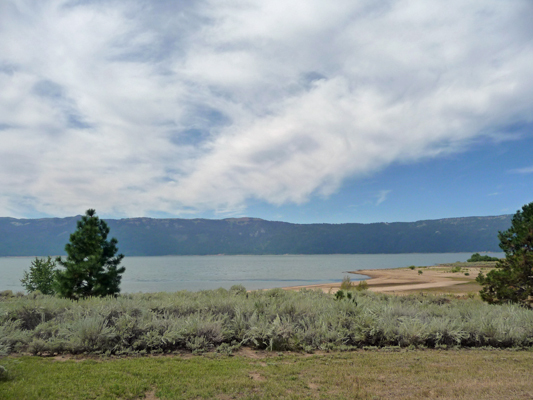 We’ll be packing up this weekend and will leave Lake Cascade on Monday August 31st. We’re headed to Hilgard Junction on I-84 near La Grande, OR. where we’ll spend September and the first half of Oct.
We’ve enjoyed Lake Cascade and hope you’ve enjoyed going on our adventures with us.